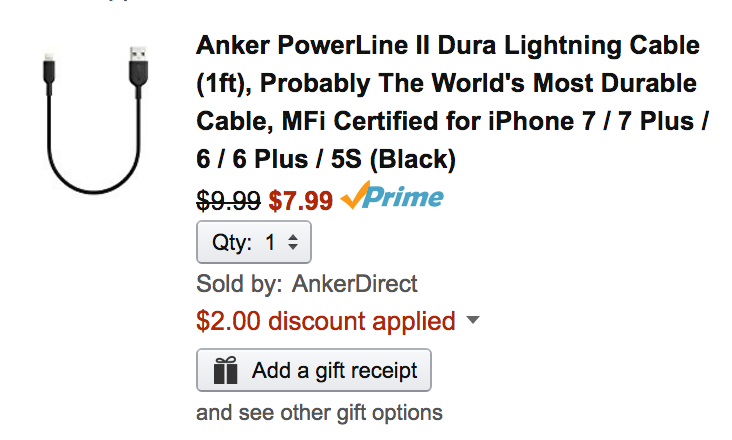 Anker recently announced its new line of PowerLine II Dura Lightning Cables and today we’re getting our first discount via its official Amazon store. You can save $2 or more on each model when an item-specific promo code is applied during checkout. Of course, free shipping is available for Prime members or in orders of $35+. Learn more in our announcement coverage. Early ratings are solid, much like the rest of Anker’s lineup. Strength In Numbers: Extreme reinforcement ensures internal wiring is protected to keep phones charging—able to support over 175 lb (80kg). Ultimate Durability: Lasts 12x longer than other cables and proven to withstand over 12000 bends in strict laboratory tests. Charge Fast: MFi certification and strict quality testing ensure your Apple devices are charged safely, at their fastest possible speed. A Cable for Life: We’re so confident about Dura’s long-lasting performance that we gave it a hassle-free, lifetime warranty. What You Get: Anker PowerLine II Dura (1ft including plugs), a hassle-free lifetime warranty and friendly customer service.